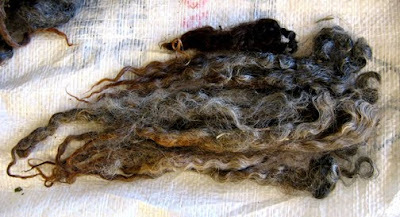 The locks all combed and ready to spin, just as soft as they look in the photo. A winter nest anyone? 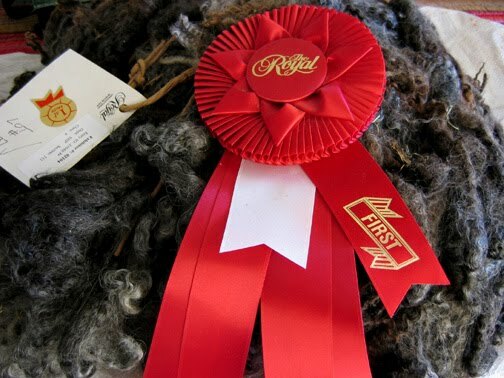 I even got to keep the 1st place ribbon this fleece won! I've done a lot of reading lately on how to do this. I've ordered lots and lots of library books on the topic and read them pretty much cover to cover. Once the locks are washed they needed to be picked apart before putting them on a drum carder. Then the drum carder combs the fleece into a batt which can be divided into roving so that it's ready to spin. 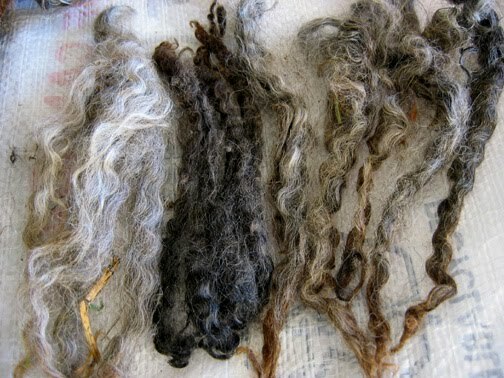 You can also use drum carders to blend a variety of fleeces together. I'd like to try one sometime, but for now they're out of the budget at hundreds of dollars. In the future I may rent one. Another way is to buy two hand carders (or mini-carders) and comb a small amount of locks at a time. Then you can roll up the fleece vertically into rolags for woolen spinning (lofty and fuzzy) or roll it up horizontally to make roving for worsted spinning (smoother, with aligned fibres). You can also use special sharp combs to comb out long locks. The last way, which is the least expensive, is to just use a flick brush to comb out each lock. A dog brush works just as well, and that's what I have. As usual I'm trying to do things the simplest way I can without too many fancy tools, so that's one of the reasons I chose a fleece with well-defined locks so I could prepare it this way. After flicking, I place the locks in a basket always aligned the same way, so I can spin consistently from tip to top. I like to store the combed locks as they are, then draft each one just before spinning it. Spinning such long locks took some getting used to, but I have the knack of it now. My big disappointment has been discovering that while the combed locks are incredibly soft and fluffy, the resulting yarn has been a bit like twine. 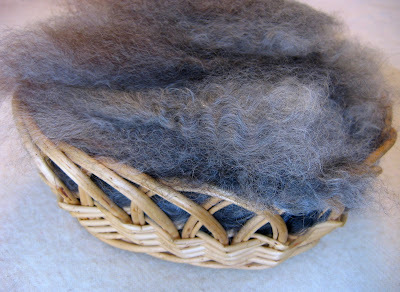 It still feels silky on the outside, but I can see now why long fleece is praised for being strong rather than soft. Luckily I didn't expect next-to-skin softness. I want to make a warm hiking sweater that I've envisioned with deer/woodland motif intarsia. I figured I can make the intarsia motifs using the variety of natural colours in the fleece. Usually I'm not one for swatching, being the impatient type, but in this case it's necessary as I have so much fleece to work with I want to make the best of it. I've spun a single, then navajo plied it, then knitted up a swatch. It's actually not bad. 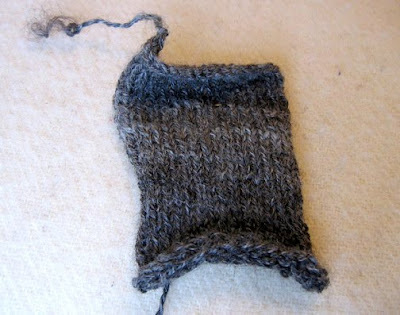 The skeined yarn looked kind of stiff and wiry but once knitted up it's smoother and softer than I expected. I'm going to vary how I spin it and see which method gives me the best results. I can try fat singles, or spinning from the fold or a different number of plies. 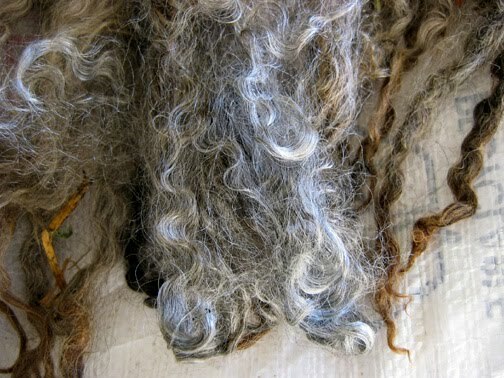 There's also the leftover soft fluff after flicking the locks and maybe that can be carded to create softer yarn. I'll let you know which method I choose in the end! A friend in Guelph passed your blog address to me and now I think you may be the lovely person I met at the Royal. I bought a white fleece and you took a far too small handful home with you. Could this be you? Yes that's me! It was really nice to meet you, I was sorry I didn't think to ask your name. hi i have just been surfing the web loking at ideas on the best way to clean a fleece, i have just broght a spinning wheel and have just sourced a farmer with loads of cheap fleeces!! hapy days.